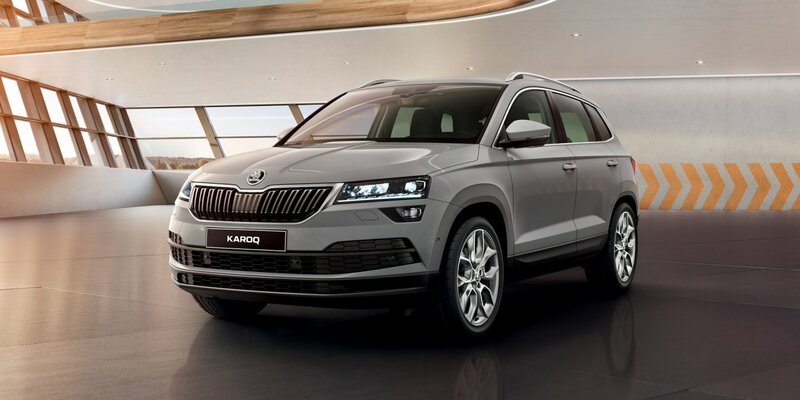 The ŠKODA KAROQ is a completely new compact SUV. The name and its spelling originate from the language of the Alutiiq, an indigenous tribe who live on an island off the southern coast of Alaska. The name KAROQ is a combination of the terms ‘KAA’RAQ’ (car) and ‘RUQ’ (arrow). Equipped for all of life's adventures, the All-New ŠKODA Karoq extends the ŠKODA SUV family and takes the brand to a new level. This self-assured and spacious SUV is a must have for navigating through city life and exploring new frontiers. Available to order now from £21,945 OTR. Representative example for the ŠKODA KAROQ SE 1.0 TSI 115PS model, with Moon White metallic paint based on a 48 month, 40,000 mile agreement. Please note * At the end of the agreement there are three options: i) pay the optional final payment and own the vehicle; ii) return the vehicle: subject to excess mileage and fair wear and tear, charges may apply; or iii) replace: part exchange the vehicle. ﻿With Solutions Personal Contract Plan. KAROQ Petrol engines receive £1,250 deposit contribution and all Diesel engines receive £1,950. 18s+. Subject to availability & status. T&Cs apply. Ordered by 01/07/2019 from participating retailers. Excludes SE Technology. Indemnities may be required. ^Service plan covers first 2 consecutive services limited to 1x Oil and 1x Oil & Inspection service. Not available in conjunction with any other offer and may be withdrawn at any time. Accurate at 04/2019. Freepost ŠKODA Financial Services. ŠKODA UK may change RRPs at any time (this includes where there are government changes in regulation and/or legislation). There may be a delay to any RRP displaying correctly on our materials. Always obtain prices from your chosen ŠKODA retailer.